Just a reminder that many of you still may be able to find the deal for a FREE $5 Gift Card wyb 3 select Oral Care items including select Listerine thru 8/25. I still noticed these bottles at my store yesterday and even better the price had dropped to $4.49. Although unadvertised deals can be regional- if you don’t see the signs- it can’t hurt to take the products up to GS or a register to see if they are prompting a Gift Card wyb 3. For me it has only been these 2 exact kinds- 16 oz Bottles of Listerine Whitening which come with a 24 ct Listerine PocketPaks as a bonus and the Listerine Cool Mint 1 Liter bottles. = $5.47 for all 3 or $1.82 each plus you are getting three 24 ct pocket packs. 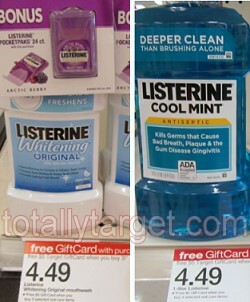 = $3.22 for all 3 or $1.07 each after coupons and Gift Card. For more details on this deal and everything included- you can check the Special Deals Page.